If the NFL (as well as all professional sports leagues) is to remain a meritocracy, then principled peaceful protest—which the owners themselves made great theater intimating weeks ago—should not be punished and athletes should not be denied employment based on partisan political provocation by the Executive Branch of our government. Such a precedent threatens all patriotic Americans and harkens back to our darkest days as a nation. Protecting all athletes from such collusive conduct is what compelled Mr. Kaepernick to file his grievance. If you still assert that Kaepernick isn’t good enough to play in the NFL, then not only are you claiming to know more than some of the greatest minds to ever play the game, but you’re also arguing that you would rather have Brett Hundley, Case Keenum, Josh McCown, Brian Hoyer, Kevin Hogan, Blake Bortles, Trevor Siemian, Jacoby Brissett, or the just-retired then unretired Jay Cutler play quarterback for your favorite team—instead of a man who fell one play short of a title five years ago, and played fairly well last year for a team with almost no quality NFL players. All of those quarterbacks played full games yesterday, with Brissett starting for the Colts tonight (comprising over a quarter of the league), and their various levels of incompetence all provided additional proof that Kaepernick is clearly getting blackballed—proving the NFL’s meritocracy to be a myth. Kaepernick should submit the tape of Bortles' performance today as part of his collusion lawsuit. Additionally, the rumors that Kaepernick is looking for top-tier starting quarterback money just aren't true. Take it from one of the most plugged-in sources in both the NFL and the bay area. In fact, Kaepernick was willing to be the backup on a team that could desperately use a mobile backup to its talented, but fragile starting quarterback who got hurt yet again. And to be clear, Kaepernick was willing to be Marcus Mariota's backup. So blow that lie up, too. Instead, the Titans signed Brandon Weeden after Mariota’s injury, who cannot run the offense they installed for Mariota (or really any professional offense), and they continue to employ Matt Cassel as their primary backup—who we all knew was bad years ago. The Titans are a playoff-caliber team who just need competent play at quarterback to win their underwhelming division, and they eschewed signing a guy who fits their mobile QB’s scheme perfectly in favor of trotting out two proven losers under center whenever their franchise quarterback gets hurt. Reasonable people can debate Kaepernick’s skill and ability level. But it would be impossible to rank him below the 89 quarterbacks on NFL rosters as of last Friday. There is no question that he is a better quarterback than some who have jobs, and perhaps some who have starting jobs as well. But that fact — and yes, I’m comfortable calling it a fact — doesn’t seem to satisfy the burden of proof required by the CBA. It seems clear that all 32 teams have reached the same conclusion on Kaepernick, if for different reasons. If that’s the result of a coordinated league effort, however, we haven’t seen the evidence required for an arbitrator to agree. To be clear, none of this is going to accelerate Kaepernick’s return to the NFL. Even if he wins this grievance, the CBA doesn’t require a team to give him a job. Instead, it spells out a process for awarding compensatory damages, at a value to be determined by the arbitrator. The real damage to the NFL could be an exposure of its inner workings via public discovery. This grievance is not going to get Kaepernick a job, nor will it likely award him any meaningful damages. This seems to be about exposing the NFL’s blatant hypocrisy through discovery, and using that legal process to establish a baseline level of backlash towards The Shield in the hopes of dissuading all sports leagues from throwing future Kaepernick’s under the bus. 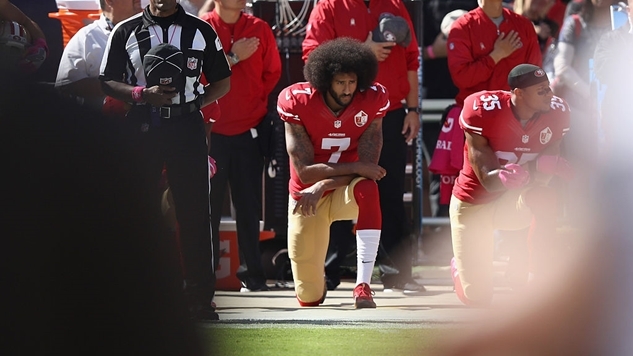 A cynical person would call Kaepernick’s filing a PR stunt (and they wouldn’t really be wrong, given how hopeless his legal case is), but PR stunts can still have altruistic ends, and this is just a further escalation of a protest by a guy who would likely be much quieter right now if the NFL had simply awarded him the roster spot he already earned.